Is It Safe To Eat Papaya During Pregnancy? →Is It Safe To Eat Papaya During Pregnancy? Pregnancy and nutrition are two interrelated concepts. It is important to note that the food you eat not only affects you but also your unborn baby. A healthy diet fit for a pregnant woman includes whole grains, fruits and vegetables, and lean proteins. While fresh fruit and vegetables should be involved in a pregnant woman’s diet, health experts suggest that unripe papaya should be avoided. While papaya makes a brilliant breakfast menu and is great for your hair, skin and digestive system, it contains a latex substance that can cause contractions of the uterus. That being said, it is ideal to avoid eating papaya during pregnancy. Ripe papaya is not thought to be a problem. 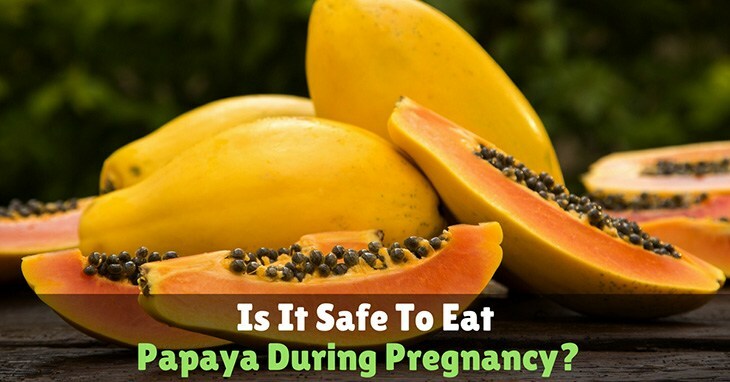 However, it is not sure if papaya is completely safe to consume while pregnant. 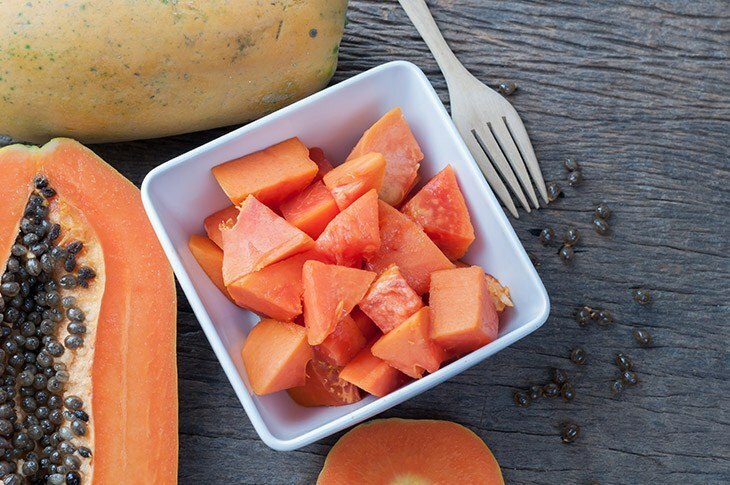 A papaya enzyme known as papain or vegetable pepsin is found to help soothe indigestion. This protein is commonly found in the leaves and the latex of the fruit. The latex acts as a prostaglandin and as oxytocin that induces labor and delivery. Synthetically developed oxytocin and prostaglandin are used to induce or strengthen uterine contractions during labor. Concerns concerning eating papaya during pregnancy often lead to confusion. According to experts, fully ripe papayas do not present any problem for pregnant women. In fact, ripe papayas are considered good sources of potassium, beta-carotene, and vitamins A and B. On the contrary, eating unripe papayas during pregnancy poses a threat. 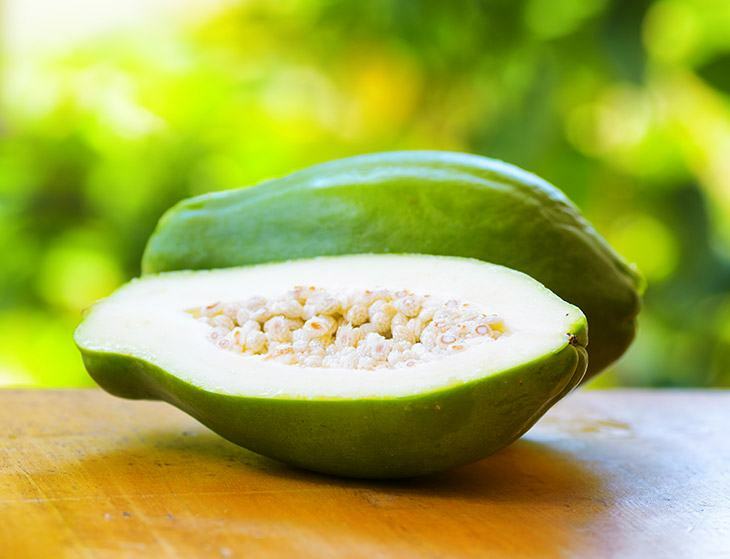 Unripe papayas contain pepsin in their latex, which induces premature labor and miscarriage. Instead of worrying about the ripeness of papayas before eating them, pregnant women are advised to eliminate the risk and steer clear from eating papaya altogether during the pregnancy. Aside from miscarriage and premature labor, eating unripe papaya during pregnancy can also induce latex allergy. Latex allergies are not only associated with allergy to surgical gloves that are used in hospitals and clinics. A latex allergy can occur if a pregnant woman comes in contact with anything including foods that contain latex. Latex allergy is not only associated with eating papaya but also other foods like apples, chestnuts, bananas, rye, and wheat. Unlike its known risks many pregnant women fear about, eating ripe papaya also has several nutritional benefits that should be considered. Boosts the Immune System. Ripe papayas contain beta-carotene, potassium, and vitamins A, B and C. These nutrients are essential to the body, as they can help boost the body’s immune system. Vitamin B is essential for fetal development. Prevents Constipation and Heartburn. Ripe papayas are good sources of fiber and folic acid and can help to avoid constipation and heartburn. Also, consuming ripe papaya aids digestion and relieves most gastric conditions and bloating. Provides Essential Nutrients. Eating ripe papaya will provide you and your unborn baby with various vitamins and nutrients. In fact, it is an excellent source of vitamin A, C, and E. It also contains high amounts of fiber and anti-oxidants. Induces Labor and Causes Uterine Contractions. The papain found in the latex of an unripe papaya causes the activation of prostaglandin and oxytocin, resulting in the induction of premature labor. Early labor can cause miscarriage. Some studies reveal that it can also cause abnormalities to the developing fetus. Restricts Fetal Development. Pepsin and papain, which are found in unripe papaya, can limit fetal growth and development. In fact, consuming unripe papaya during pregnancy can also cause embryotoxicity, post-implantation loss, and anti-implantation of a fertilized egg cell. Weakens the Essential Membranes of the Fetus. It is also found out that unripe papaya can reduce the vital membranes that affect the survival of the fetus. Papain is considered a proteolytic enzyme which is used for cell dissociation. It can delay the fetal cell growth and tissue development. Causes Edema and Hemorrhage. Unripe papaya can cause hemorrhage and edema, as it can exert excessive amounts of pressure in the blood vessels. With decreased blood perfusion, fetal development inside the uterus is affected. Excessive Bowel Movement and Miscarriage. While papaya can relieve constipation and cures inflammatory bowel problems, it has the tendency to promote excessive bowel movement due to its high fiber content. An excessive bowel movement can exert pressure in the uterus, resulting in miscarriage. Unlike in pregnancy, eating papayas are recommended after labor and delivery and during breastfeeding. Papayas are thought to enhance breast milk production in nursing mothers. Papayas contain proteolytic enzymes which aid lactation. Also, Papayas also contain carotenoids which provide vitamin A and beta-carotene, both of which are good for the body. There has always been a concern whether it is safe to eat papaya during pregnancy. In fact, a lot of women are quite confused and have doubts what to believe. Studies show that eating unripe papaya can induce premature labor and uterine contraction because of papain, which is contained in the latex of the fruit. While ripe papayas do not pose a threat, it is still best to eliminate the risk and avoid eating papaya throughout the course of the pregnancy. Is It Safe To Have Mango In Pregnancy First Trimester? Is It Safe To Try Hot Bath To Induce Labor? My name is Crystal Waston. I am a mother of three wonderful children. I started MakeYourBabyLaugh! to help parents who are struggling to raise their children.I hope that my experiences in child-rearing can inspire and help parents overcome their parenting struggles. Which Closure On A Cloth Diaper Is The Best? My name is Crystal. I'm a mother of three wonderful children. I started MakeYourBabyLaugh! to help parents who are struggling to raise their children. I hope that my experiences in child-rearing can inspire and help parents overcome their parenting struggles. MakeYourBabyLaugh.com is a participant in the Amazon Services LLC Associates Program, an affiliate advertising program designed to provide a means for sites to earn advertising fees by advertising and linking to Amazon.com. Additionally, MakeYourBabyLaugh.com participates in various other affiliate programs, and we sometimes get a commission through purchases made through our links.